When Google first announced Chromecast, this little device sounded perfect. The dongle, which simply plugs into any HDMI slot, is only $35 and turns any TV into a smart TV. It also comes with a few free months of Netflix, which makes it an even better deal. That being said, there were a few problems. The biggest problem was the lack of apps that this little dongle supports. The point of Chromecast is to easily fling apps that you are using on your computer to the dongle. Things like Google Play Music and Netlifx work well. You can even fling videos that you are watching on YouTube to the little dongle. Unfortunately for Google, this was not enough for people to feel like it was worth the low price of $35. Now, Google is happy to announce that Pandora is coming to Chromecast. In short, you can easily turn your TV into an entertainment powerhouse. In short, it looks like Google was a little caught off guard with how high the demand was going to be for Chromecast. Instead of having everything ready for this device right out of the gate, it has taken the company some time to make Chromecast live up to its potential. 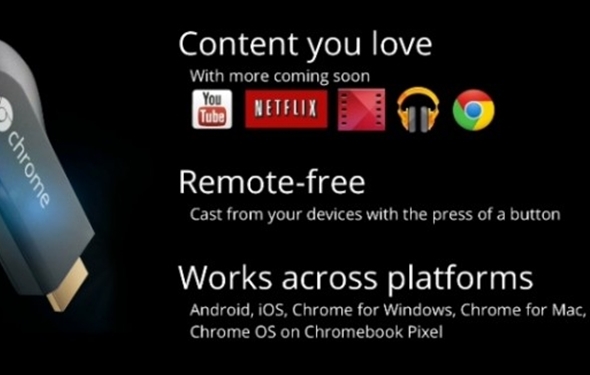 When Chromecast launched, it only had support for four apps. This included YouTube, Netflix, Google Play Movies and TV, and Google Play Music. These are nice, but people were hoping for a little more. It took Google a few months before it even got Pandora support on this little device. Pandora is not the only thing that Chromecast has gained support for. Just last month, Chromecast finally got support for Hulu Plus. Of course, this is something that people felt the little dongle should have supported right out of the gate. After all, Hulu Plus is one of the largest streaming services on the market. Although it is nice to see Chromecast finally getting some new apps, it is a long way off from replacing other devices like Roku. After all, Roku actually adds new channels and apps to its lineup every day. It knows that the only way to keep gaining more support is to keep adding support for its TV boxes. A spokeswoman from Google told CNET that the company is very excited to bring more content to Chromecast. It has only been a few months since the little device came out, and it has already added support for a number of apps. Google will continue to look for ways that it can improve Chromecast and make it a better device for everyone. Chromecast does not offer much more than what you can get from other devices. For example, gaming systems like the Wii U already allow you to watch Netflix, Hulu Plus and Amazon Instant Video. The Wii U browser also supports HTML 5, which means that watching videos on YouTube and other sites is simple. The same can be said for upcoming systems like the Xbox One and the PS4. The Chromecast is slowly going to get phased out before it even gets a chance.